This group hosts a collection of PECE essays built by graduate students in the class Ethnographic Methods taught at the University of California Irvine, fall 2018. This assignment is to produce a PECE essay that presents a preliminary project design and set of research materials ready for comment and possible use by other researchers. In doing this, students 1) practice digital data management 2) practice preparing for peer feedback in the midst of research (rather than only at the end of a project, as usually happens) 3) practice configuring research data for reuse by other researchers 4) practice preparing research data for sharing within publications (linking to source data, with framing that contextualizes) 5) practice working with open source software and a noncommercial repository for managing your research data. "A Bridge Home: Emergency Temporary Housing"
(Who is) Thriving in a Hotter LA? This image represents page 10 in the City of LA’s Sustainable City pLAn 2nd Annual Report 2016-2017. 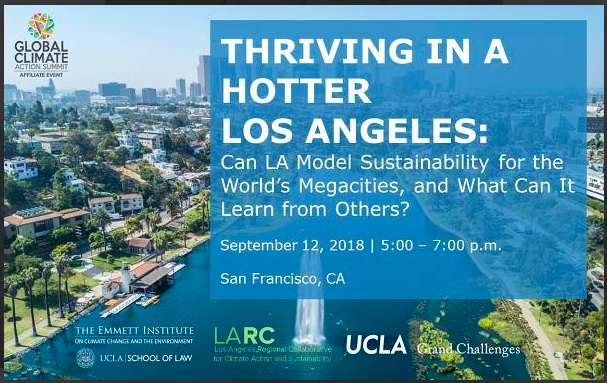 It directly follows two pages documenting “the people behind the plan” - LA’s Departmental Chief Sustainability Officers and the Mayor’s Sustainability Team. 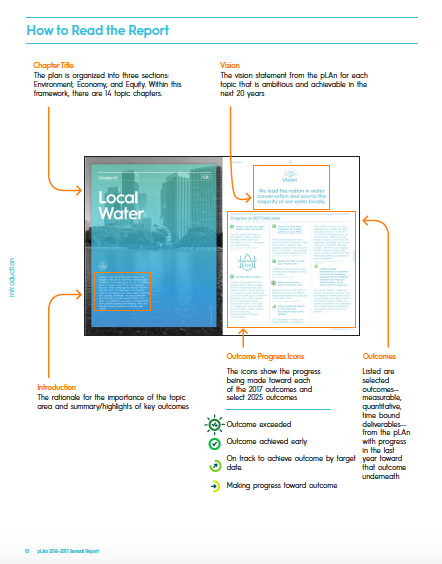 On this page, an image of two pages found later in the document is used to tell the viewer/reader “how to read the report.” I chose this image because it signifies the role of the expert in guiding the work and understanding of sustainability. Unlike most images that one encounters, this one is direct: the viewer is socialized as to how the image should and can be read. There is little room for interpretation --or deviance-- by the non-expert in this light. 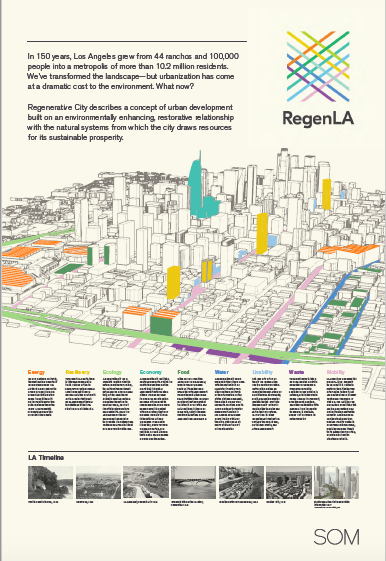 This image is an infographic from the firm SOM and was described as intending to “[advance] SOM's global thinking about the city of the future.” Here, Los Angeles serves as a case-study for this interdisciplinary design firm with a goal of moving beyond a “sustainability framework” to one that is “net positive.” The color-coding of this infographic signifies the nine design principles SOM proposes in approaching this work. At the bottom lies a ‘timeline’ of LA representing 150 years -- 1900 to what would (will) be 2050. In this, the question seemingly becomes: what will a ‘regenerated’ LA look like in 2050? This infographic is informative in that it describes the firm’s 9 general design principles for a net positive city. At the same time, it maps (literally) these principles onto the black and white, and importantly blank, graphic rendition of DTLA. By such, it seems to indicate action points, while also leaving room for opportunity, or perhaps the unknown. How does SOM’s understanding of the history of LA provide a framework for their rendition of the city’s future?